„A recurrent topic in the financial press for much of 2018 has been the rising risks in the emerging market (EM) asset class. (…) the yields on their sovereign bonds have climbed markedly, as capital inflows to these markets have dwindled amid a general perception of deteriorating conditions. 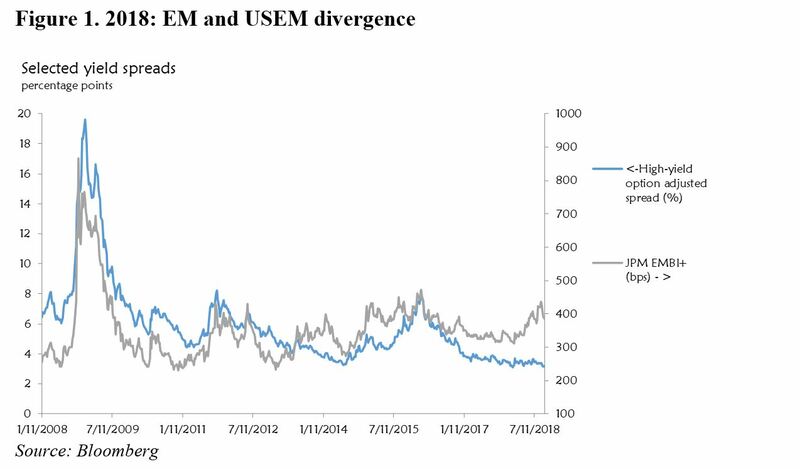 „Historically, there has been a tight positive relationship between high-yield US corporate debt instruments and high-yield EM sovereigns. (…) In the course of this year, however, their paths have diverged (see Figure 1). Notably, US corporate yields have failed to rise in tandem with their EM counterparts. What’s driving this divergence? Are financial markets overestimating the risks in EM fixed income (EM yields are ‚too high‘)? Or are they underestimating risks in lower-grade US corporates (USEM yields are too low)?“ – bto: Meine Erwartung ist diesbezüglich klar. Die Märkte preisen die Risiken in den USA völlig falsch! „In what is still a low-interest-rate environment globally, the perpetual search for yield has found a comparatively new and attractive source in the guise of collateralized loan obligations (CLOs) within the USEM world. According to the Securities Industry and Financial Markets Association, new issues of “conventional” high-yield corporate bonds peaked in 2017 and are off significantly this year (about 35 % through November). New issuance activity has shifted to the CLO market, where the amounts outstanding have soared, hitting new peaks almost daily. 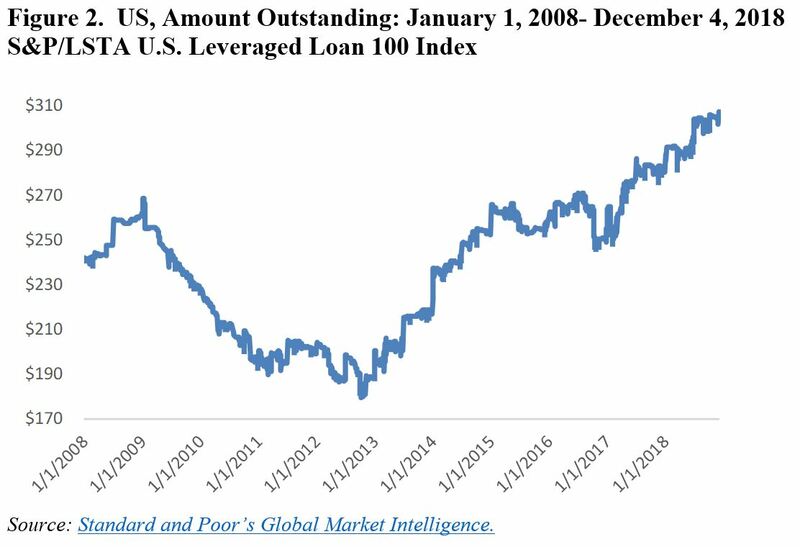 The S&P/LSTA US Leveraged Loan 100 Index shows an increase of about 70 % in early December from its 2012 lows (see Figure 2), with issuance hitting record highs in 2018.“ – bto: Und wie ich auf bto schon mehrfach besprach, sind es zunehmend unerfahrene und leichtsinnige Käufer. „These CLOs share many similarities with the mortgage-backed securities that set the stage for the subprime crisis a decade ago. During that boom, banks bundled together loans and shed risk from their balance sheets. Over time, this fueled a surge in low-quality lending, as banks did not have to live with the consequences.“ – bto: Das ist eine wesentliche Parallele! „The share of ‚Weakest Links‘ – corporates rated B- or lower (with a negative outlook) – in overall activity has risen markedly since 2013-2015. Furthermore, not only are the newer issues coming from a lower-quality borrower, the covenants on these instruments have also become lax. Covenant-lite issues are on the rise and now account for about 80% of the outstanding volume.“ – bto: Auch das wissen wir schon länger. Es ist immer eine Frage der Zeit, bis es zum Problem wird. Je länger alles gut geht, desto mehr werden die Risiken verdrängt – bis sie dann „über Nacht“ wieder da sind. „(…) the odds of default rise with mounting debt levels, erosion in the value of collateral (for example, oil prices in the case of the US shale industry), and falling equity prices. (…) the CLO market (like many others) is vulnerable to runs, because the main players are lightly regulated shadow banking institutions.“ – bto: Ich denke eher, es liegt an der Dummheit und der Gier der Investoren. „Like the synchronous boom in residential housing prior to 2007 across several advanced markets, CLOs have also gained in popularity in Europe. (…) up almost 40 % in 2018. Japanese banks, desperately seeking higher yields, have swelled the ranks of buyers. The networks for financial contagion, should things turn ugly, are already in place.“ – bto: So ist es. Aber natürlich ist diesmal alles anders! Vielleicht kleinkarierte Semantik, aber ich finde es epochaler in der Aussage. Bitte um Entschuldigung, natürlich genau umgekehrt. Kopierfehler, sorry. Die starke Zunahme der Volumina ist an sich noch nicht das Problem. Das Problem ist die massive Verschlechterung der Qualität der Leveraged Loans und der CLO´s, welche in den letzten Jahren stattgefunden hat. Die Risiken werden dabei von den oftmals leider recht ahnungslosen Käufern völlig unterschätzt. Das Erwachen wird äußerst schmerzhaft.